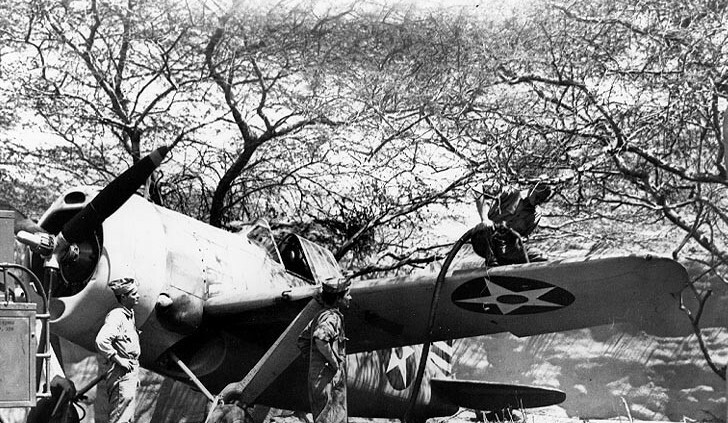 The Brewster F2A Buffalo a United States Navy and Marine Corp fighter used in the early days of World War II. Built by the Brewster Aeronautical Corporation it was on of the first monoplanes to have an arresting hook and able to be used on aircraft carriers. In 1939, the Buffalo won the competition withe the Grumman Corporation F4F Wildcat to be the USN’s first monoplane fighter aircraft. Several countries; Finland, Belgium, Britain and Netherlands ordered the Buffalo. Finland was very successful in in repelling many Soviet aircraft that were a part of USSR’s invasion of Finland. From 1941-1944 the de-navalized B-239 had an amazing 32:1 victory over most Soviet aircraft during that time. In December 1941, the British and Dutch used Buffalo B-339D/Es in combat with the Japanese Mitsubishi A6M Zeros and Japanese Army Nakajima Ki-43 Oscars and were totally overwhelmed by the faster and more agile Japanese fighters in the Far East Asia theater. The Allies aircraft were lightened by cutting back on fuel and ammunition but that didn’t help much. The F2A-3 saw action with the USMC (United State Marine Corp) squadrons at the Battle of Midway. The Buffalo F2A-3 was decidedly obsolete and no match for the Zero. The term “flying coffin” was adopted by the pilots at Midway. In 1935 the USN put out a request to the American aviation manufacturing community for a carrier based monoplane fighter to replace the aging bi-wing Grumman F3F. The Brewster Aeronautical of Long Island New York initially lost the bid to Seversky P-35. The P-35 was eliminated when it failed to reach the required maximum speed of 270 mph. The new F2A-1 had a modern look with all -metal fuselage and wings although the control surfaces were fabric which was the practice at the time. It was powered by a Wright R-1820-22 single row Cyclone radial engine that could push the Buffalo at a 2,600 climb rate per minute with a top speed of 277. The aircraft was taken Langley Research Center for wind tunnel test. Modifications made from the results added nearly 27 mph to it’s speed, now a 304 mph. The armament consisted one .50 cal M2 Browning machine gun and one .30 cal AN Browning machine gun, both mounted in the nose. In 1938, the USN awarded the Brewster Aeronautical Corp a contract to build 54 of the F2A-1. But do to production delays only 11 of the Brewster F2A-1 went to the USN. When things did get rolling in New York, the remainder of the Buffalos were modified to the B-239 verison and sent to Finland. A newer version came out from Brewster called the F2A-2 with a more powerful engine, Wright R-1820-40 single row radial , which produced top speeds 323 mph, not too bad at the time. A new propeller was used, better landing gear, but still no cockpit armor and self-sealing fuel tanks. In January 1941 108 aircraft were ordered this being the last F2A-3 delivered to USN and USMC. The F2A-3 now had a new, self-sealing fuel tanks, armor around the cockpit and increased ammunition storage in the aircraft. The new innovations added weight thus causing a decrease in rate of climb , speed and maneuverability. The off-set was the bigger engine had s two speed Cyclone supercharger gave it higher altitude performance and was an excellent cruising engine. The Saratoga and the Lexington used them in the early days of World War II. By then the USN considered the F2A Buffalo (all variants) to be obsolete. Many of the newer more advanced fighters were still be built or being tested and the Buffalo had to weather the storm. When the replacements came the Buffalo was relegated to the training squadrons as an advanced training aircraft. In early December, 1941 the USS Saratoga was sailing toward Wake Island with a 20 Brewster F2A-3 and 7 Grumman F4F Wildcats as part of a relief force, when USCINCPAC diverted the Task Force to Midway. Earlier in December the VMA-211 F4F Wildcat squadron had be dispatched from the USS Enterprise to Wake Island. 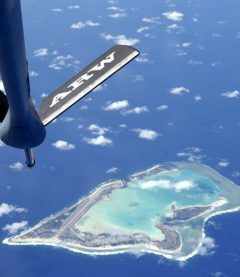 Then On December 8, 1941 The Japanese attacked Wake Island, but stubborn resistance from the ground USMC troops prevented the Japanese from taking Wake. The USS Saratoga was the rescue force , but the military leaders apparently didn’t want to engage the Japanese with such a rather lean Tak Force. Because of the Pearl Harbor disaster , the Saratoga was sent to Midway Island. It wasn’t until May of 1942 that VMA- 221 using F2A-3 Buffalo, engaged the enemy on that fateful day. There were 30-40 “Val” dive bombers heading for Midway with Major Floyd Parks led the Buffalos into the fray. The VMA-221 managed to down several Vals and then the Zeros come from on high and 13 of the 20 Buffalos were shot down. Major Parks was strafed by a Zero after bailing out of his buring Buffalo. He did not survive. 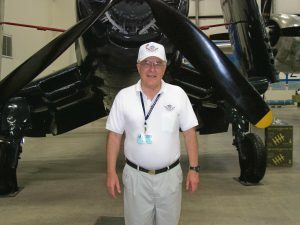 Lt. Charles Kunz recalled: “I was at an altitude of about 9,000 and shove over in a dive trying to shake the plane on my tail until I was about 20 feet from the water I was making radical turns hoping the pilot couldn’t get steadied on me. I glanced out of the rear and saw that it was a Zero fighter. I continued flying on a rapid turning course at full throttle when I was hit in the head bu a glancing bullet. After he fired a few short bursts he left, as I had been in a general direction 205 degrees away from the island. My plane was badly shot up. In my opinion the Zero fighter has far been underestimated. I think it is probably one of finest fighters in the present war. As for the F2A-3 it should be in Miami as a training plane, rather than used as a first line fighter” . After the Battle of Midway, marked the end of the use of the Brewster F2A (all variants) in front line combat for the United States. 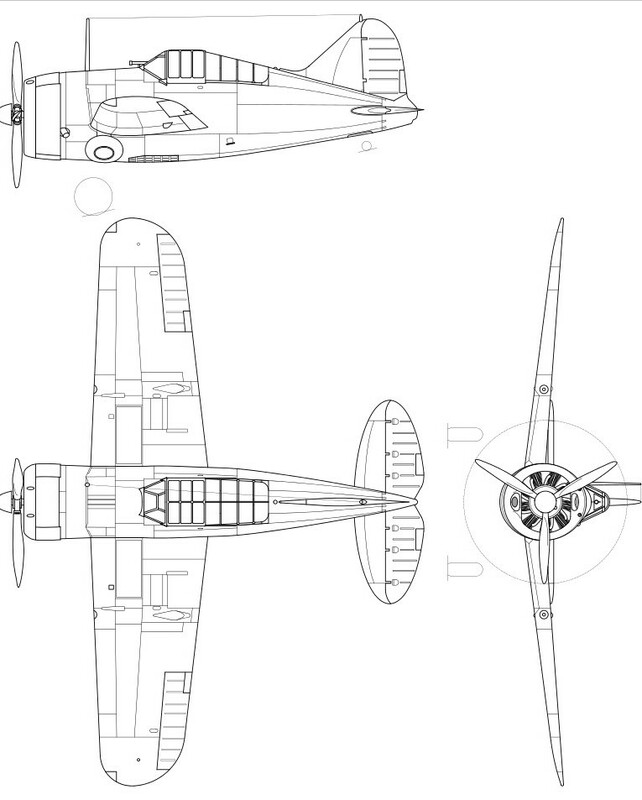 The new Grumman F4F Wildcat was vastly superior to the Buffalo in every way except range. The Brewster F2A Buffalo became a distant memory.